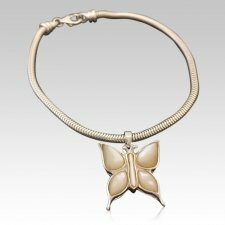 The Pearl Butterfly Cremation Bracelet is sterling silver and is crafted by an artistic skilled jeweler one at a time. The quality is excellent and the craftsmanship is outstanding. The charm holds a small amount of remains, a piece of hair or something that is small enough to memorialize your loved one and bring them close to your heart. The charm is ideal for any 'Pandora' style bracelet. 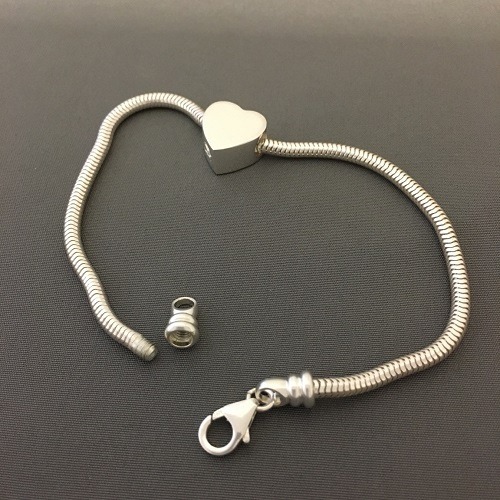 The bracelet is also similar to the 'Pandora' style and the closure ring can be removed from the end to add more charms (the closure ring can be glued on if no other charms are to be added).